What could you do if... you could calm your mind, improve your health and take back control of your life? A simple but powerful guide to take back control of your mind, body and life. Learning to keep things in perspective and remain positive is essential if you want to enjoy life. Imagine how your life might be different if you remained confident, relaxed and happy; even when things don't go to plan. "Take control of your life by taking control of your mind and body." You lose composure and get stressed too easily and frequently. You panic when you do not get the result you were hoping for. You feel like you are constantly putting out fires. You return from work feeling tired and stressed and with little energy for your personal life. You are not quite as happy as you could/should be. Don't Sit in Silence! Learn Maintain a Calm Mind and Healthy Body Today! When you have confidence and composure, you will socialise more successfully. A calm mind and healthy body will ensure that you have sufficient energy and motivation for all aspects of life. You will experience improved performance and results due to effective rest and recuperation. Stress, fatigue, worry and anxiety all work to prevent happiness. You will learn to remove these from your life. Increased confidence and composure leads to a clearn mind and better decisions. Confidence and composure are signs of strength and leadership and act like keys to others' hearts and minds. You will be able to act confidently and decisively when things go wrong; as they will. If you are easy to talk to and get along with, more people will be willing to provide you with opportunities. People are inspired by those who this display calmness, confidence and strength. 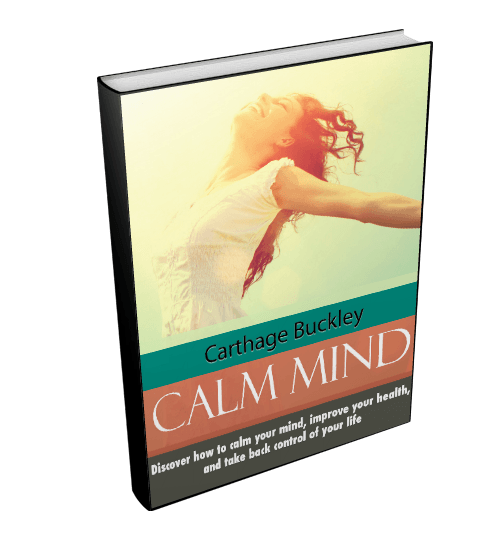 Get instant access to Calm Mind now! You don't have to sit in silence and accept things as they are. You can choose to learn and implement effective, healthy and confidence building strategies today. How to maintain perspective. It is not the event itself which governs how we feel. It is our perception of the event. Some people remain calm when things go wrong; others freak out. You will learn to be one of the calm people. How to tap into flow states for ultimate performance. Learn to sustain a state of heightened performance withouth the downsides which we normally associate with stress. How to create a peaceful, tranquil but effective life. When you live a peaceful and tranquil life, you will experience better decision-making. You clear your life of the things which do not matter so that you can spend more time on those that matter most. "When I read Carthage's writing, it really hits the spot. It is as if he has written the book specifically for me." "For a long time, I refused to accept responsiblity for my life. Instead, I blamed everybody else. I now realise the impact that my poor sense of perspective was having on me. I am making the changes which need to be made and I am definitely happier for it." The 'Calm Mind' Checklist covers all of the main points from the book, enabling quick revision. The 'Calm Mind' Resource Guide will introduce you to a broad range of valuable resources which will enable you to discover more about the topic and increase your learning. Try It Out 100% Risk-FREE for 7 DAYS! I am so confident that you will love 'Calm Mind' that I am offering you an unconditional 7 Day Money Back Guarantee. If you do not like 'Calm Mind' , for any reason, just email me within 7 days and I will refund your investment. No questions asked. "'Calm Mind' teaches you that you can focus on your own happiness, make it your number one goal and still live a successful life." "I have always been a perfectionsit and when things would go wrong, I would throw the toys out of the pram. My focus is no longer perfection; it is now calmness and happiness. I am achieving more of both and; my results have improved too." Take charge of your emotional, spiritual and physical health and; take charge or your life. Start living your optimal life today.